De La Salle College Revesby has embraced a whole-school approach towards tackling violence against women and girls as part of the innovative White Ribbon Program, Breaking the Silence. Through this national program which started in 2009, students are encouraged to take a leadership role in fostering a respectful society in their schools and communities which condemns domestic violence, sexual harassment and assault and promotes a safe, inclusive environment for all. Through the support of Sydney Catholic Schools, teachers at De La Salle College Revesby undertook a series of professional workshops through White Ribbon late last year, aimed at providing them with the resources needed to embed models of respectful relationship across the school culture and all classroom activities. Teachers and executive school leaders have then been able to implement what they have learned in the workshops through White Ribbon presentations at whole school assemblies and pastoral lessons led by year coordinators. The students have also become actively involved through a Mufti-Day White Ribbon fundraiser and a Training Day targeted at Year 10 students, aimed at encouraging them to model respectful relationships to junior students in Year 7. The Training Workshop was led by White Ribbon Ambassador Mr Dale Palmer who played a pivotal role in implementing the school-based program as former Principal of Endeavour Sports High School in southern Sydney in 2009. Mr Palmer led the De La Salle Revesby students through a series of group activities covering respectful relationships and ways they could then act as role models in this area for students across the junior secondary years. "I would strongly encourage other schools to get involved in the Breaking the Silence Program", explained De La Salle Revesby teacher, Mrs Lacy McCormack who helped organise the workshop for the Year 10 students. 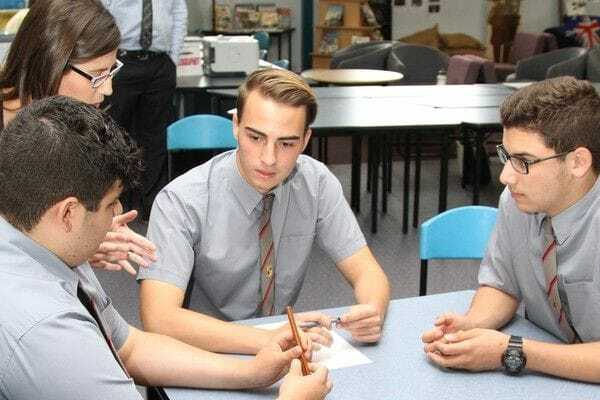 "It's a really effective way to develop a culture of respect in a school community and with teachers having such busy workloads, the program is essentially led by the White Ribbon ambassadors who provide all the support and online resources you need to then implement it effectively in the classroom", she added. "I believe one of the greatest strengths of the program is the way in which it empowers the senior students to act as role models in their schools and that fits in very well within our Lasallian tradition as they act like big brothers to the juniors".